Yow. No fun. Take care. Carter- So sorry to hear of your mishap!! I guess a little break from boat building is in order. Hope you heal quickly and can get back on your project soon! Sorry to hear about your injury. Hope you get back on your feet quickly. Damn, everyone's getting hurt or falling ill, just at the time when spring is here and things can get done and splashed. Get rest, lots of it and she'll happily be waiting for 'ya, when you're better. Thanks guys. I feel your love. I jammed the ball into the hip socket pretty hard, but the break at the femur is "non-displaced", so the only treatment is stay off it. Not easy, as you might suspect, but I'm a month and a half into it and hoping for just one more month. The doctor and my wife are both pretty strong willed females, so I don't expect to be cutting any corners. In my case, falling is not necessarily bad balance...it's purely bad judgment and lack of attention. Historically, I have been able to get away with dusting my self off, giving my wife a grin and telling her something like, "Heck, I was a paratrooper. We were trained to do that". If at one time she thought that was cute, or amusing, I think it's wearing pretty thin now. Your wife’s look says it all! (I think we’ve all gotten “that look” from our ever-lovin’ at one time or another.). Get well, and don’t push it! That pretty boat of yours will wait. It's been about three months since I last posted after my fall from the loft in the garage/broken hip incident. I'm pretty much healed up now and back to my regular routine. I've been able to spend most of the last of a couple of weeks working on the OB20 and have gotten the hull glassed. A nice milestone. I noticed that during my recuperation, I was awarded "Advanced Member" status. It reminds me of the day in Vietnam that our Battalion Commander came out for a field visit and just before flying off promoted me from Second Lieutenant to First Lieutenant. I said, "Thank you, sir. What did I do to deserve that?". He said, "Nothing son, keep up the good work". As we all know, the trouble with amateur boatbuilding is life keeps getting in the way. This time for me, it's wildfire. 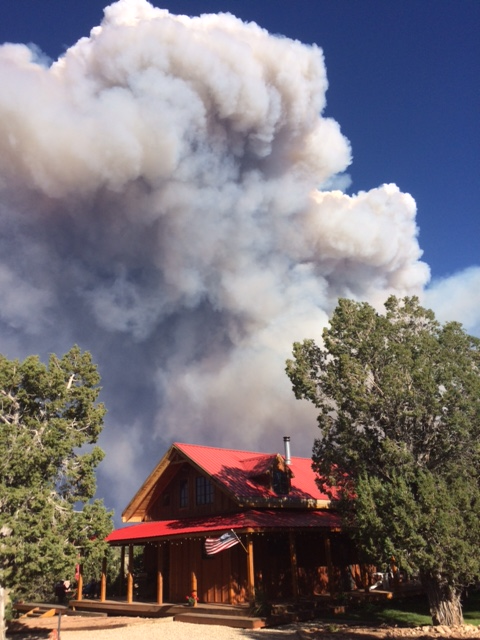 I believe it may have been on the national news (Dollar Ridge Fire in Wasatch and Duchesne Counties, Utah). but it's certainly big news here and very close to our cabin, shop and my OB20. Not to mention a bunch of other people's properties. Last count was about 100 homes lost, several hundred firefighters on the job, lots of aircraft, only 4% containment, 50,000 acres burned so far, high temperatures, no humidity, high and shifting winds, etc.. Pretty scary. We evacuated yesterday (the fourth day of the fire) to our home near Salt Lake City to get out of the way of the professionals. All part of the risks we assume when we live in, or near, the wildlands, I guess. The photo below makes it look much worse than it actually is, but it's still super scary. Another, no so frightening, obstacle to boatbuilding has been a small camper trailer I have been working on. It's a teardrop trailer kit from Chesapeake Light Craft. I characteristically thought I could toss it together while I built the OB20. So far, it's been about two years for both of them and...well, you know. 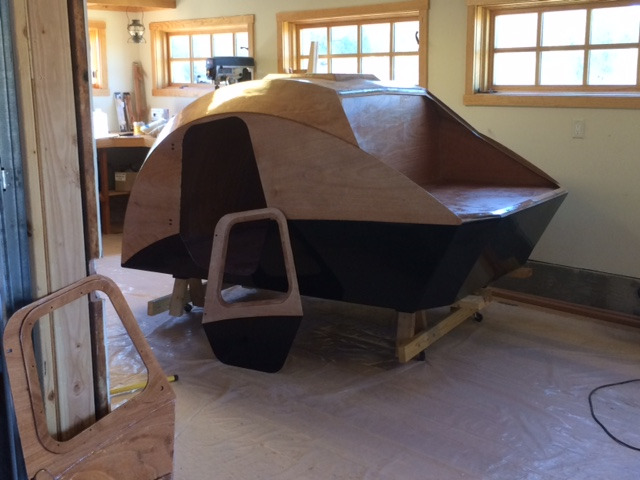 It's a great kit that any boatbuilder can appreciate and we're anxious to go camping in it some day. It goes together via stitch and glue in a female mold. Fun and interesting. There are some brilliant people working in this business and John C. Harris is one of them. I have a question regarding fiberglass fill coats. 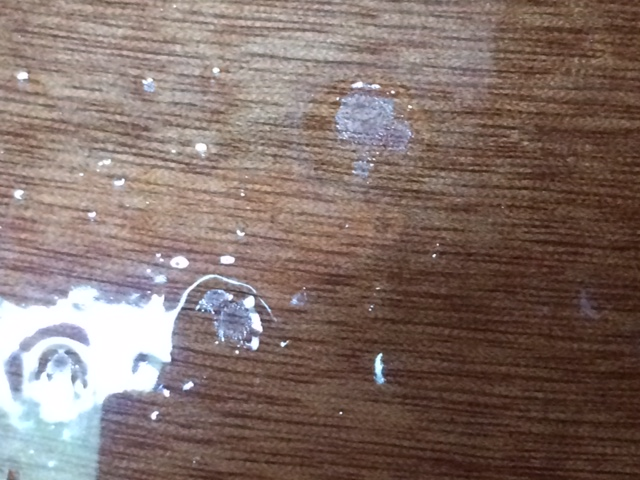 Up to now, I have been able to apply subsequent coats of epoxy twenty-four hours, or so, after the previous coats and achieve a chemical bond. On account of my broken leg hiatus, most of my project has had a few months to cure. 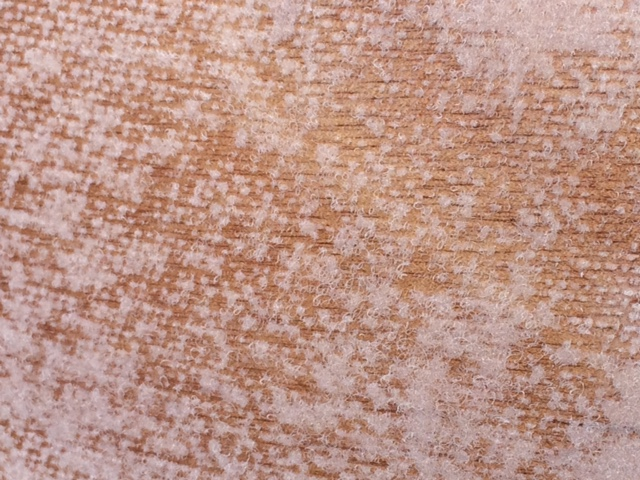 I've read that a "light sanding" is required between coats, if the resin has cured, to get a good mechanical bond. So the question is...how much is enough? As you can see from the photos, I have knocked the tops off the resin at the bumpy parts of the fiberglass weave. It seems funny to me that it would be okay to give it tooth in some spots, but leave it shiny in others...but I'm hoping that's the technique. Any help would be appreciated. My understanding is that, between blush and bonding concerns, the entire surface should be sanded to dull leaving no shiny spots. Keep on sanding. Those shiny spots (if well cured) will not stick well to the next coats of epoxy. I wouldn't worry about accidentally sanding a bit into the glass on the large flat areas but around the chine and any joints I would sand as minimally as possible to maintain the glass fibers over the joint. In a perfect world, all the glass weave is filled with coats of epoxy or slathered with epoxy+microspheres mixture while the glass/epoxy is still within the curing window but sometimes you just can't. If there is a spot where you feel the glass just isn't there anymore you can just put a patch over it and fair it in with the primer coats. I mentioned earlier that I have completed a couple of simple, stitch and glue kit boats and have picked up a few skills, but am pretty much in awe of this OB20 project I have take on. It's going slow for all the usual reasons, but it's going good. 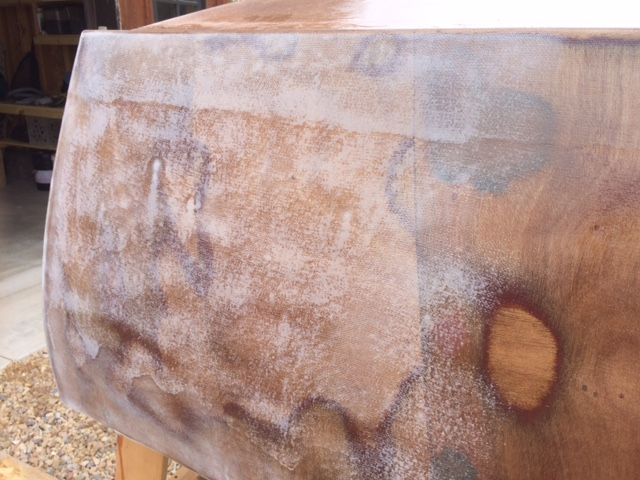 The hull is glassed with no wrinkles, bubbles, starved fabric, runs or pooled epoxy. I'm very happy with it so far and looking forward to some serious fairing. Your comments and advice are truly appreciated. I haven't posted for a long time and decided that I should, just to make sure that no one accuses me of quitting on my project. I haven't. I haven't been moving it along very fast, but I'm still at it. Actually, I've spent lot's more time on it than one can tell by looking at it. My buddies, who at one time would ask, "Dude, how is that boat coming along?" now just go to my wife and say, "Is he okay?". What do they know? 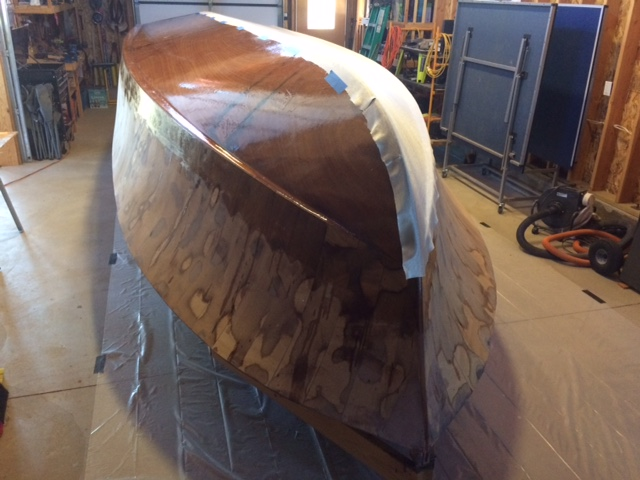 Boatbuilding is a delicious pursuit and I just take more time to savor it than most. Some time back, after coating the entire hull with what I thought might be the last coat of clear epoxy, I discovered millions of little blemishes. I thought it might be outgassing, but Alan said it was probably fisheyes. Either way, the solution was to sand it down and start over, which I'm getting pretty good at (or at least accustomed to) and I figure a boatload of fisheyes is a good omen. I'm anxious to get this thing flipped over, but of course, need to get the bottom completely faired and painted first. The skeg is attached, the chines have been shaped and I'm getting close to primer, etc.. 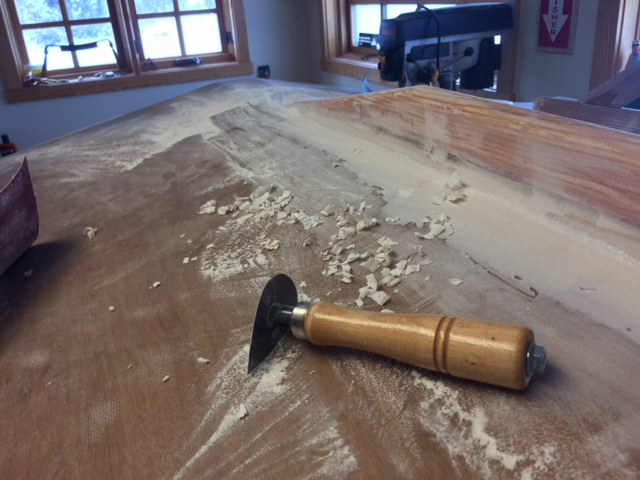 While fairing out the large fillets on the skeg, I discovered a great use for a small scraper that I've had for a long while, but never used much. It really does a nice job cleaning and shaping green epoxy. I plan to roll and tip an epoxy primer and a two-part polyurethane finish, and have a question about high build primers. I've done quite a bit of DIY remodeling/drywall work and have learned one thing for sure...it almost never looks as good as I think it should when the finish coat goes on. With this in mind, I'm planning on quite a bit more fine fairing. Smccormick joked on his thread about using Kilz primer and I've seen other people suggesting the same thing a little more seriously. 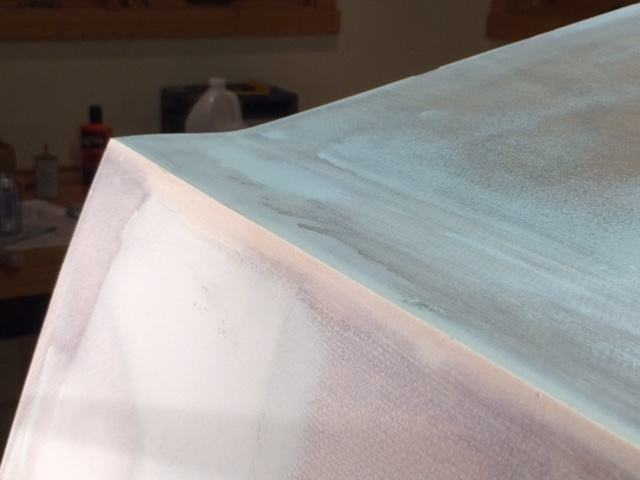 I'm wondering if it would be okay to work with Kilz2 primer (it's latex, not the PVA wallboard primer) under the epoxy primer to save a few dollars. As smcormick said, most of it ends up on the floor anyway. Good idea, or bad? Thanks for updating us, I like the photo of the sanded chine. Really looks good. I can't tell you how many things you wrote in this post that resonate with me and my build. When I began i thought it would take me a year. At that point my wife asked me how much longer? A year? I said "it better not". Two years later close but... love my fantasy world. As for the Kilz primer, I believe the latex product is not workable in any case. The oil based product can be used with single part paints. Honestly, my knowledge is based only on what I have read, I have no first hand experience. I was going to use Kilz and rustoleum on a one design planing sailboat that I have until I realized that I can't get either of those products in the PRC. Going to end up with a $600 paint job on a $100 boat. For your fillets, small lengths of pvc pipe make pulling and sanding them much easier. Pull the fillet with one size larger than you want and sand with the size your looking for. Wrap 36 or 50 grit sand paper around the pipe and get your rough shape. After it's close, skew the pipe out onto the flat surface, working both sides of the fillet to blend the radius without undercutting the fillet. Move to 80 before getting it fully blended so you have some room to clean it up. Thanks for the fillet tip and your thoughts on the Kilz primer. I was obviously hoping for an inexpensive, easy to sand, high build primer. I'm glad I asked about it and really glad you responded with some wise advice before I slathered all 200st of my hull with the wrong stuff. I'll probably play it safe and go with Jamestown Distributors Total Boat high build epoxy primer and two part finish paint. There are probably cheaper and easier ways to get it done, but this seems safe. I've loosely followed your build along with all the others, but just recently started yours (and one of Chick's) from the beginning. It's great bedtime reading...kind of like a memoir written by someone you sorta know. Carter, nice to know that I have a reader. This forum is a great place to hang out. Some folks have great success with Kiltz. Some say latex based, some say oil. I tried the oil and didn't like it. Never tried latex. I would say to only use it under enamel or latex finish paints, not your expensive two-part poly. But, that's only my opinion. I have used Rustoleum marine, and I like it. It is on the deck of Old Codger. I just can't see spending a lot on small boats that are gonna get used hard. Unless they are built as show boats. For bigger boats, the poly is well worth the effort and price. (Do what I say, not what I do.) But, you can save a lot by buying industrial two part paint rather than marine. Correction. I got 'em mixed up. I used the latex Kiltz. Never tried the oil. I personally only use Kiltz as my go to primer, white can with red lettering. Its the oil base and for 25 plus years now. It is not easy to apply in any windy conditions. But I always roll it and use a small brush in the corners. I use a short nap roller and can apply multiple coats, allowing a coat to dry to touch . I normally get two coats in a day depending on the temps. And in the warmer times three coats. I then allow to cure fully for three to four days minimum and then sand. It sands very hard and properly sanded its a slick as an onion that's been peeled. And yes I use it for a primer for two part awlgrip paints and it works just fine for most all home built boats. Just make sure you wait about a week in warm weather to apply. I also wait about two weeks in the cooler times to sand and then apply. I have had no problems with lifting. And a gallon of it costs around 15 bucks or so. The oil based birds eye primer is similar in make up. Just my pennies worth anyway......And if you are unsure about it, take a scrap piece of plywood and try a sample on it using the above method before going this direction on your bigger boat project.. Sounds good to me, Oyster. I'l try it on my next project. Maybe using the water based Kiltz was my problem. HEY "ACTION TIGER"------Don't you have something to say about this?